Spring has arrived again, and in what is a very unusual occurrence for me, the turn of the season is coinciding with the end/beginning of print projects! 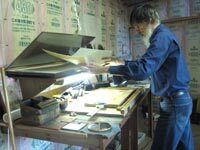 For many years now, I have arranged my printmaking projects to come to completion at the end of the calendar year. Then, when the January exhibition is done, I begin something new. This year, because my large scroll project took an extra few months to wrap up, things are different. I shipped the completed scrolls at the end of March ... graduation! Then, with the cherry blossoms all around me, it was time for the Entrance Ceremony for my next project! Perfect time for a fresh start! A special feature of this issue is a 'photo-essay' on how the scrolls were made, for the benefit of those readers who haven't yet seen one. 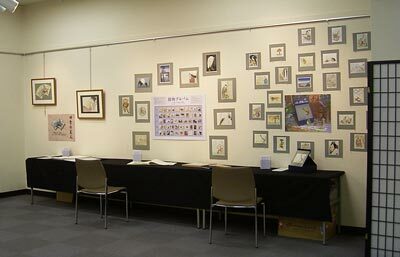 We also have a report on the exhibition, a look at last year's finances, and we'll wrap up with Sadako's Corner. What a switch this exhibition was from the previous one ... from 24 prints, down to one - from too many prints to enjoy properly, to not enough! But although the quantity of new prints on display was limited, I would like to think that the quality made up for it! The main focus was of course the Kaigetsudo scroll print; I had originally intended to complete that project within 2006, but as the year drew to a close it became obvious that I wasn't going to reach that deadline. The exhibition dates are set in stone a couple of years in advance though, so I had no choice, I prepared a couple of sample scrolls and put them up on display. Production of the actual edition for the collectors then came later, after the show was over. The show wasn't just this single item of course; the set of 10 new year card reprints - the Small Print Collection - were also on display, and the back room was filled with a large selection of prints from my other print series, as well as a display - and sale! - of the new Mokuhankan prints. That's one corner of the exhibition that will definitely be a permanent presence, growing every year. 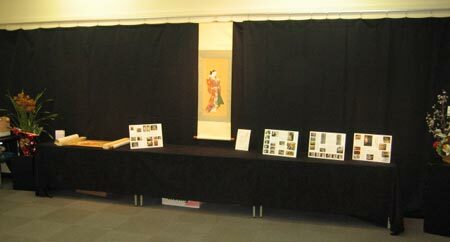 It is a matter of no small frustration for me that the Kotsu Kaikan rental timetable forces us to do all the setup on the same morning that we open the show, and as that is the most logical day for the Gallery Talk, 'Opening Sunday' is the toughest day of my entire year! But once that frantic first day is over, I can relax and spend the days chatting with friends and collectors who drop by. After weeks filled with printing work, the week-long show thus becomes a kind of 'break' for me. As always, the next project is announced at the exhibitions, and this year was no exception. I prepared an explanation panel and some order forms for the new 'My Solitudes' series, and was pleased to find that initial reaction to it was for the most part positive, even though it will not get under way until the summer. So that's eighteen annual shows now under my belt ... I wonder what kind of prints will be on the wall next year! It'll be here before we know it, I'm sure! I mentioned in the Exhibition Report how the scroll print wasn't completed in time for display at the show, but that was a few months ago; I can now report that the project has wrapped up - the waiting collectors have received their scrolls, and my barens have been put away for a time, to await the start of the next project. 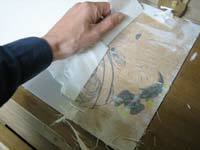 This print is very large, and woodblocks of that dimension are extremely expensive. By using a special printing table that I made, I am also able to use smaller blocks specially cut to fit the detailed areas of the design. 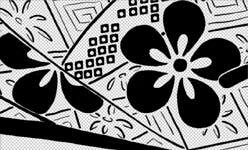 I have to make a tracing of not only all the important lines in the image, but all the patterns too. ... I prepared a full-size colour image of the original scroll, and scanned it into my Macintosh computer. ... I use a touch-sensitive tool on a 'tablet' to control the drawing. ... The tablet/stylus combination is extremely sensitive, and I can create lines that are very close to real brush strokes in appearance. A sample of the completed 'hanshita' tracing. In order to carve a complete set of blocks for all colours in the print, I of course have to include every tiny detail of the original painting. 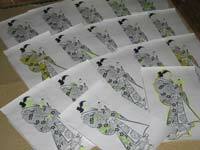 With the hanshita drawing completed, the next step was to have it duplicated, on special paper I prepared. 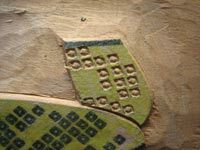 Next comes the long process of marking up each sheet to show just what part of the wood needs to remain, and what is to be cut away. 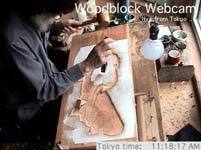 This photo is taken from the Woodblock Webcam, the video camera that looks down on my workbench, and which broadcasts live on the internet while I am working. This is part of one of the pattern blocks. It's not finished at this point. All the little squares have to be cut out ... but without disturbing the tiny dots in the center of each one! There are 13 pieces of wood used to print this design. But doesn't tell us how many printing areas we have. Because there are so many diverse colour areas in this design, it is frequently possible to combine different colours on one block. My master printing guide lists 42 specific colour areas, varying from a tiny carved area to print the lips, up to the widest ones to print the background areas. My blocks are brand-new, but I am finding that they are almost 'alive'. At every stage of the printing process, I need to constantly adjust the registration. I do this with the assistance of a large sheet of stable mylar plastic. 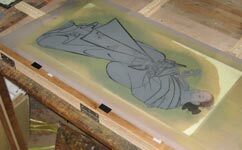 The colour blocks are put in place on the banch, and then adjusted by looking down through the image on the transparent sheet. 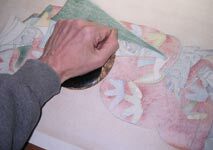 Holding it in a curved shape, I gently lift each sheet from its bed and bring it forward over the block. 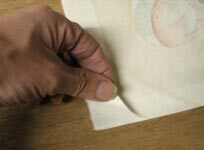 As you can imagine, a piece of soft and damp paper this large is very difficult to manoeuvre properly, so I keep tension across the width to keep it from flopping down too soon. All my experience to date has been with relatively small prints, and scaling up to something of this size has brought with it so many new challenges that the work has proceeded very slowly indeed. After printing is finished I have to bring the print down to the proper thickness to allow mounting as a scroll. If it were too thick, it would become creased and spoiled when rolled up. I tease up the fibres of one corner. Once they start to separate, I keep pulling until the back half of the paper comes free. Most scroll mounting workshops these days use a modernized process involving glue and a large press, but I wanted the job to be done using traditional methods - with paste and air drying. 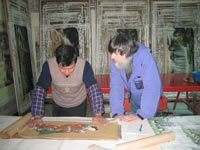 This photo shows Mr. Wang Jianfang of Suzhou, China, studying one of the prints during our discussion. 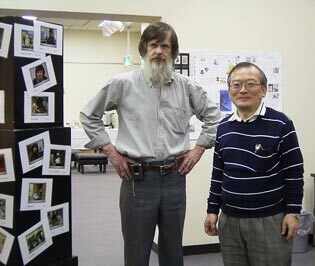 We were pleased with the samples of his work that we saw, so decided to ask him to do our job. Thanks to the wonderful cooperation of collector Mr. Yoko Tauchi - who is a professional calligrapher - all the collectors will receive paulownia boxes with her beautiful calligraphy on top. So here we are at the end of this long and intensive project. It has indeed been a most educational and interesting year of work. I am now a much more experienced printer than I was a year ago! And the final thing I have to mention before you turn the page and move on to the next story - I made more prints than I had orders, so I still have scrolls in stock. I'd be happy to send you one! Time again for the Annual Report to 'shareholders', your chance to see the numbers in the background. I wrote in last year's report "I decided to challenge the long project of making the Kaigetsudo scroll, knowing full well that this would not be anywhere near as popular an item as the Treasure Chest had been. My income this year will be very low ..." and that's exactly what happened. My new print publishing venture - Mokuhankan - got started up during the year, but as one might expect, wasn't able to contribute much to the income yet. In fact, I spent more on printing fees than I earned in sales, but it's all investment for the future; hopefully this part of the chart will move into the 'black' in the not-too-distant future! Another new entry on the chart this year is the item for book royalties. I have previously let some of my print images be used in magazines and books, but it was always quite small-scale. Last year though, I was fortunate to have my Hyakunin Isshu prints used by a company producing colouring books, and the royalty income went a long way to helping me keep my head above water. I was able to save a bit of money last year by switching to a different production system for this newsletter. For many years I have had it produced by offset printing, but recent issues have been all 'digital'. I create the master copy on my computer, burn it to a disc, and then take that downtown to a 'digital convenience store', where I run off the required number of copies. I was a bit surprised when I saw the bottom line of the chart this year; honestly speaking, I had expected it to be much lower than it turned out! Did I actually have that much money left over? What did I use it for? Well, a pretty good chunk went on an expensive air ticket for the visit to my new grandson, and as for the rest, I guess I probably ate most of it! And something that doesn’t show in this chart is the substantial assistance that my parents have provided for my daughters, notably Fumi’s college expenses. I don’t know if they are pleased, or upset, that their 55-year old son still needs their help! What will this chart look like next time? I have to say that I haven't the slightest idea. This year I have - again! - chosen a difficult project, one almost guaranteed to be far from a 'best-seller'. Hopefully though, with support from enough collectors, I can keep that bottom line above zero for yet another year! "I'd like to try it - just sitting quietly in one place for 24 hours." Putting a tent and sleeping bag into a rucksack, along with some simple food, his preparation is done. It's not 'hiking', nor is it the kind of outdoor life we hear about recently. It is simply to put oneself into the natural scene, to be part of the environment in a way that doesn't disturb the creatures there with your presence. Just a few hours after his tent is packed up, the flattened grass is back to normal, and no traces remain to show that he was even there. 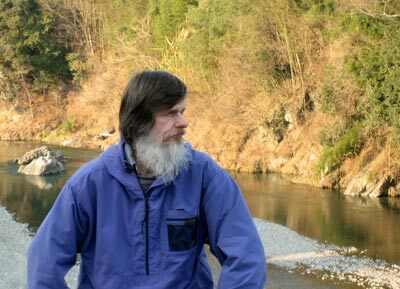 It seems as though there are a few secret places - known only to David - within walking distance of his Ome home. 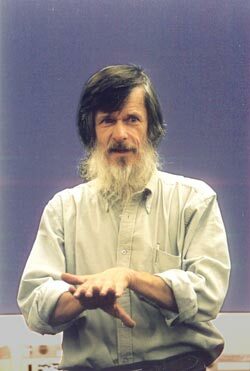 For each of these full long days, he vanishes from his busy life, and hides in nature. What does he see there, and what kind of interesting things happen to him? These stories will take you there - from the sounds of the night that follow the sunset, to the fantastic scenes of morning light unveiling snow-covered slopes. In his eyes, a natural beauty that cannot be expressed in a photograph is transferred to the delicate paper and captured in woodblock prints. Enveloped in the mood of the landscape which you hold in your hand, you read the accompanying story. Everybody can travel together with David, and enjoy the feeling of being part of this nature. So 'natural landscape' is the theme, for these stories, and David's first-ever series of original prints. Please consider joining David's new project! Production details: 12 prints, each one issued as a separately bound volume (in traditional Japanese tied binding). Volume 1 is scheduled for delivery in June~July, with the rest following at approximately 2-month intervals, finishing in the spring of 2009. How should I reply? Even though we always seem to be together, we are actually not married. We live separately, each in our own home, are quite independent from each other, and have completely separate finances. At the first few exhibitions I helped with, my reply to such questions was a mumbled ”Well ... ...”, then after a while I started saying “Something like that ...”, but sometimes when I couldn’t be bothered trying to explain, I just replied “Yes.” But these are kind of evasive answers, aren’t they? So recently, I have decided to just tell the truth, and now reply “No.” Once though, the questioner then stared at me suspiciously, her eyes clearly showing that she thought I was lying! My own eyes instantly flashed a “None of your business!” answer! But what _is_ the appropriate word to describe our relationship? Each of us once had family around us. When we met, Dave was already divorced for some reason and I was a widow. Even during the time that we were getting closer, we each put priority on our own responsibilities as a parent. 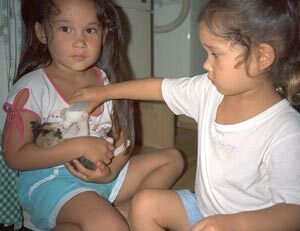 As more years went by, Dave’s daughters moved to Canada and my daughters reached an age where they are mostly independent from their mother. We usually get along quite well, not only working together but also relaxing together: going on trips and picnics, going to the movies, out for dinner and so on. When I need assistance with something, David comes over to my house and helps with heavy garden work or similar things. If David is invited for an event or a formal dinner, then I go with him as his partner with no hesitation. Reading this, some of you might be puzzled and ask “Then why don’t you get married?” Honestly speaking, there was a time when we thought about this, but when we gave it deeper consideration, and asked ourselves if such a move would lead our relationship in a positive direction, the answer was not so clear. We are very different - of course from different cultural backgrounds - and often find that we have opposite views on things. Over and above this, our living styles are very different. When we list up such differences one by one, we can’t find a clear reason to start living together. Here I would like to insist that if we wanted to raise a family together the story would be very different. In that case, we would face life as a married couple with resolution, negotiating through the differences. I personally think that this is the basic reason for a couple to be married. If you expect to have a family, then you must live together, as being a parent is such an important task! But we both graduated from that stage of life some time ago, and are now ready to appreciate a more mature phase of life. So we find no reason to put ourselves in a situation that restricts our liberty, and forces us each to cope with the (expected) conflicts that would inevitably arise. I guess David thinks the same way; it must be a precious situation for him to be able to devote himself to his printmaking work as much as he wants without being bothered by any interference. So that’s where we are, continuing to steer our two boats towards the future. While we continue to mutually support each other, our boats may float a bit apart from time to time, but for the most part we sail along side by side. I hope that we will be able to maintain this relationship as long as we live. “Are you Mrs. Bull?” “No, I am his partner.” Is this understandable? In the Autumn issue of this newsletter last year I included a short item featuring my re-acquaintance with Mimi-chan, the family cat, during my visit to Vancouver last summer. As it turns out, our meeting came none too late; not long after I returned to Japan, I heard from my daughters that Mimi had passed away peacefully one night in her sleep, at 17 years of age. When I myself was a child, our family had any number of different cats - none of them seeming to survive too long, always falling victim to traffic or illness. But my two daughters have had the experience of having one family 'partner' through their entire childhood. I am sure that because of this, they have felt the loss much more deeply than I. But they have so many memories of happy times together! Mi-chan ... sayonara!